This post seems relevant to the recent Ferguson protests in response to the grand jury decision in the Michael Brown case. 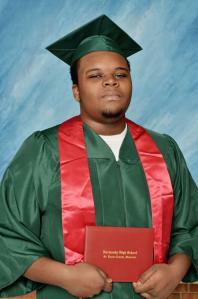 Michael Brown’s picture in his graduation cap and gown, holding his Normandy High School diploma, from this online article. Darren Wilson, has been named as the police officer who shot Michael Brown, an unarmed teenager, on August 9, 2014. This shooting occurred 2 years, 5 months, and 14 days after an unarmed, teenaged Trayvon Martin was shot and killed by George Zimmerman, a neighborhood watch coordinator. Unfortunately, this scenario has become commonplace; an African American being subjected to police brutality, excessive force, and even death.